The Institution of Civil Engineers (ICE) has recognised a Leeds-based project manager with its Yorkshire and Humber Emerging Engineers Award. 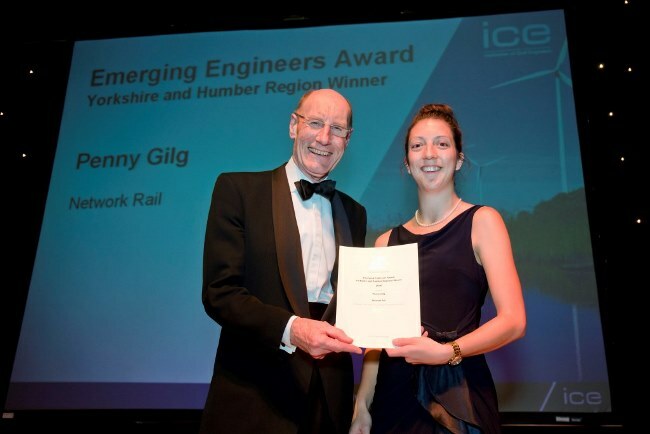 Penny Gilg, 27, was presented with the award for a paper detailing the engineering challenges faced by the team that designed and built the new south entrance of Leeds Railway Station, in which she worked as a project manager. Employed by Network Rail, she has masters’ degrees in both civil engineering and project management. The award-winning south entrance, which was designed to help the regeneration of the area south of the station by making it more accessible to people arriving in to the city, presented a number of complex engineering challenges, such as working in a river and above a busy railway. The Emerging Engineers Award is presented every year by the ICE in Yorkshire and Humber to a local graduate or student member, including young engineers who are still in education or those that have recently left and are starting their careers. Penny receives a certificate and £250 prize. ICE regional director Penny Marshall said: “I’d like to congratulate Penny on her well-deserved award. It recognises her contribution so far, and that engineers can make a difference even relatively early in their careers. “This award also shows why more women should choose engineering as a profession; gender is no issue in what might once have been seen as a male-dominated industry. Penny Gilg said: “I’d like to thank the ICE for hosting the competition which I enjoyed taking part in. I’d also like to thank all the people who worked on the project with me, who gave me some great material to write and speak about.